At the end of the second day of a conference in Churchill College in Cambridge, I wandered the streets with my boss who forced me into The Eagle pub for a couple of pints. I miss pubs. I miss history. America doesn't have any proper history. Oman was in the dark ages until its renaissance in 1970. Singapore plonks HDB blocks and shopping malls on top of anything older than a few decades. The Eagle pub (according to the Green King website) dates back to the 14th century. 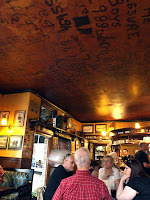 The walls and ceilings in the bar are decorated with the scribblings of WWII RAF pilots. Francis Crick announced the discovery of the structure of DNA in the pub in 1953 while customers with black Labrodor dogs probably consumed steak and kidney puddings with pints of warm ale. It doesn’t get any more British than that.